The easy accessibility of a public defibrillator and prompt actions by the Canada Games Complex staff and Thunder Bay paramedics were given credit for saving a man’s life. Based on a release by the Superior North EMS officials, a 64-year old man collapsed while he was playing squash at the Canada Games Complex. The staff immediately called for emergency assistance while a complex supervisor along with 2 lifeguards cared for the man who ceases to breathe and does not have a pulse. CPR was started and a defibrillator was used until they were able to restore a pulse. 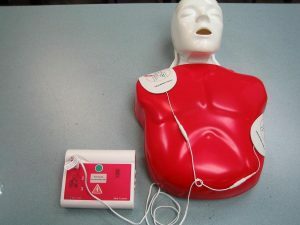 CPR was started and a defibrillator was used until they were able to restore a pulse. Upon the arrival of the paramedics, they took over the scene. The man was transported to the Thunder Bay Regional Health Sciences Centre where he is still under treatment. According to Superior North EMS Deputy Chief Andrew Dillon, it is best to check the location of a public access defibrillator. It is also ideal to enroll in a CPR course. The life-saving skills can help save a life.